Grabbing the attention of skeptical prospects in a crowded marketplace is getting harder. So how can you be heard and standout from this noisy crowd? 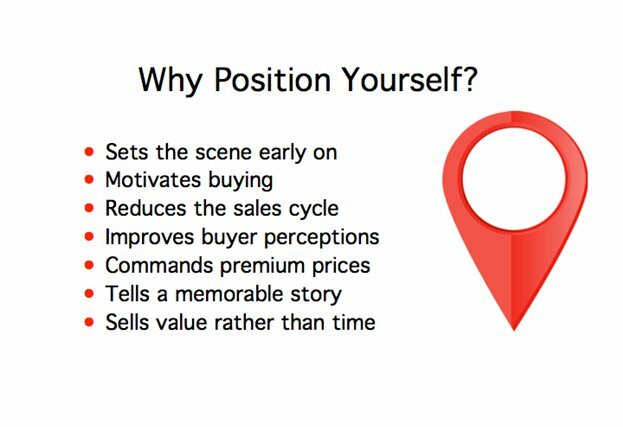 You can jumpstart by positioning your product, service or brand properly within your marketplace. Here’s a short excerpt video from a recent presentation I did at MIT for MIT start-ups. 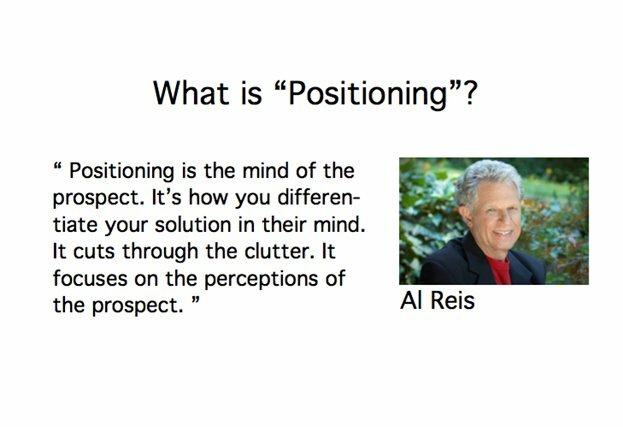 We’re going to cover what is great positioning, why positioning is so important and how to set the scene early on. If you can set the scene early on before you even have any contact with your prospects, it motivates buying. It also reduces the sales cycle. If you position with a level of authority, you already start building the important know, like and trust. It also improves buyer perception and in a lot of cases can command premium prices. If you look at Apple for example, their positioning is on the premium level. They’re rare breed because they position mass market on the premium level. Great positioning tells a memorable story. It allows you to sell value rather than time, which is really important if you are a specialist. Filter. It allows you to filter people. 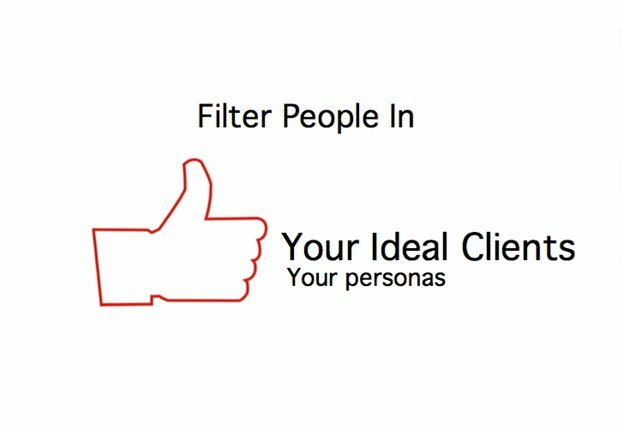 You can filter people in: your ideal clients. You can also out the bad fits. 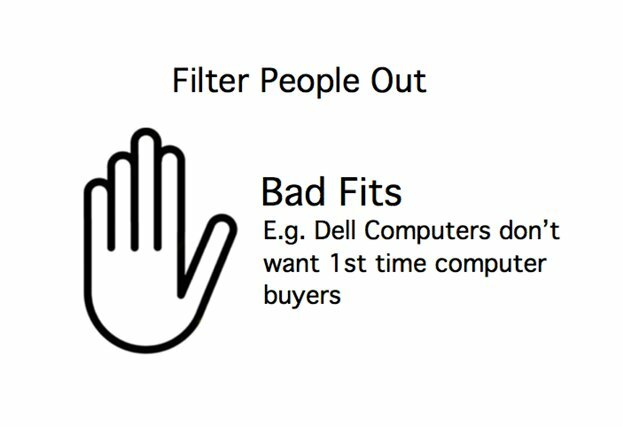 Dell computers do a really good job of this. They don’t want first time buyers. They will make it difficult for Granny Edna to get into their sales cycle. They don’t want six calls from her on the first day she buys her computer to find out how to switch the damn thing on. They filter them out. Depending on your product, you may want to position yourself at the high end, mid-range or at the mass-market lower end. Due to time constraints, in this example, I’m going to show you how to pre-frame high value. I sell high value products and solutions and I know this level very well. Exclusive. 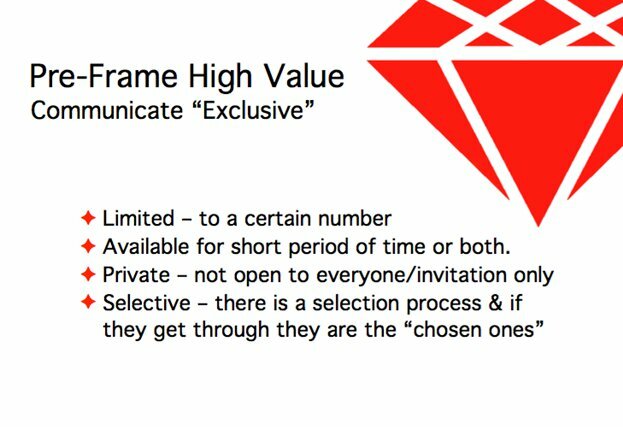 If you are looking to position yourself on the higher end you should communicate exclusivity. You can do this a few different ways. You can be limited to a certain number of people or available for short period of time or both. Apple do a great job at this. They conveniently run out of products on launch day and have people queuing around the block because they want to position exclusivity even though they sell mass-market products. You can position as private so not open to everyone. Invitation only. You can be selective in your positioning. If they get through, they are the “chosen ones”. Founders Card do this really well. Their card gives perks to members. You can only join Founders Card if, you are invited by another member. But it clearly says on the website, there’s only 70% chance that you will actually get through and become a member. When you do become a member, you have to pay them $600 a year for the privilege. They pre-frame exclusivity really well. 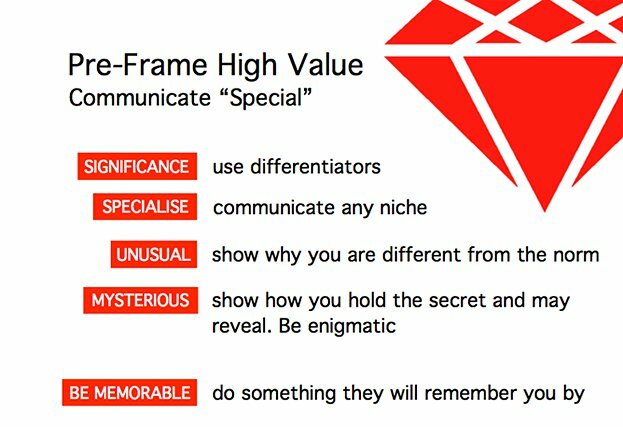 To pre-frame high value, you can also communicate special. Use any differentiators you have and be significant. Communicate any niche that you might be involved in. A lot of people don’t want to niche. They want to broaden out but specializing further will command premium prices. I have various friends who run marketing businesses. Some of them are generalist marketers and some are niche marketers. The niche marketers always earn a lot more than the generalist marketers. So for example someone who specialises in marketing for dentist will generally charge more than someone who markets for all small businesses. 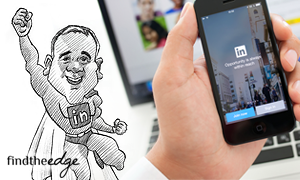 Or someone who specialises in Facebook marketing will make more money than a “Jack of all trades” generalist marketer. Are you unusual? If so subtly tell your audience. Don’t be scared of being unusual. Is there a mystery to you or your business? Do you hold the secret? Do you hold the key that you can reveal when people join? Do something that they will remember you by as well. Unique. Are you unique? Communicate it. Lots of start-ups are so scared of saying, “Listen, I’m new.” Sometimes I have start-ups come to me and say, “Should I kind of bend the truth and say that we’ve been up and running for a while?” I’m like, “No.” The term ‘brand-new’ sells so many products and services. If you’re the only, if you’re the best, if you’re the most, just let people know. 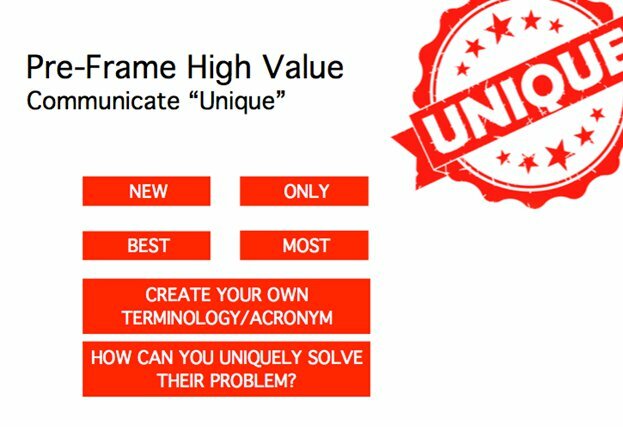 Create your own terminology or acronyms. You’ll see good marketers do this all the time. It helps people remember your message. 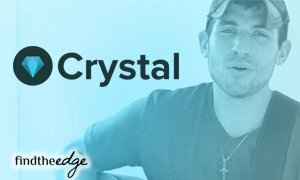 So, how can you uniquely solve your audience’s problem? 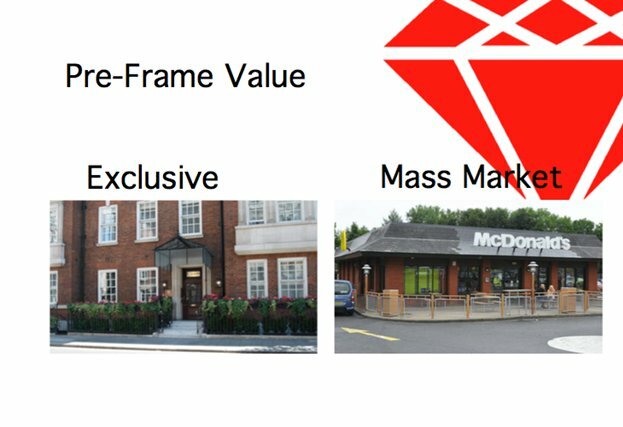 Let me just give you two examples of different values being pre-framed really, really well. The first restaurant is owned by one of the UK’s most famous Chefs – Michel Roux Jnr. Kate (My wife) and Michel co-presented a TV program together on BBC called “Food & Drink”. He was the food and she was the drink. He owns this restaurant called Le Gavroche in Mayfair in London. He pre-frames exclusivity and high-value. You have to book six months in advance to get a table. If you contrast that with McDonald’s, they don’t want to do that. They pre-frame “accessible” and “available to anyone”. They are mass-market and they’re with that. 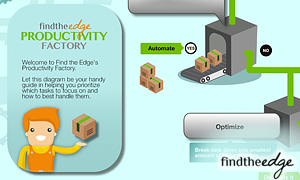 Work out what level you want to position your product or service as well. In this section, we covered what is great positioning, why positioning is so important and how to pre-frame positioning. I hope you enjoyed this extract from my recent presentation for MIT Alumni. 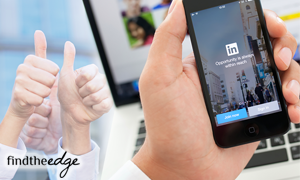 If you’d like to get full access to the presentation, then just click the button below.